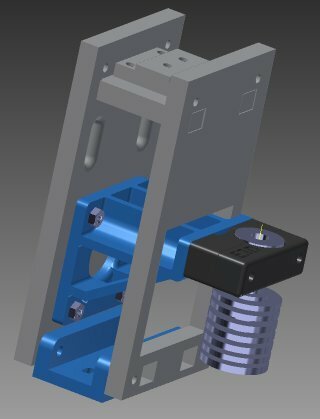 Just wanted to get some thoughts on a concept for top mounting the stepper. Any thoughts or concerns you have? I presume that you are attempting to regain the vertical height that would otherwise be lost because of the E3D hot end setup and/or to place the inertial loads closer to the rail carriage? Very interesting actually, and other than some potential wiring headaches it should work quite nicely, I would think. I faced much the same concerns when I went with an E3D V6 hot end with a Volcano heater block and a Titan extruder. I resolved the inertia concerns by remoting the motor and Titan to the side frame and using a Bowden tube feed instead of mounting the motor to the carriage at all. That saved the better part of a pound of weight from the moving assembly. As for the height problem, I created a rigid but light weight replacement for the motor that moved the E3D hot end mount points up to what would normally have been the top mounting screws of the "motor face". So now the entire assembly is folded upwards and despite the Volcano heater block's additional height the nozzle tip is at approximately the same height as the stock tip was. That's a pretty clever solution you came up with! Yes, you hit the nail on the head as to why I am looking to change out the gantry. Also, after a year, my gantry is really warped because I never did put true spacers between the front and back plates. I had to epoxy parts back together as I was installing my E3D hotend/Titan combination. How do you like the Titan as a Bowden setup? Do you use flexible filaments at all? I haven't yet, but am reluctant to go to a Bowden because of the potential to in the future. I definitely like the idea of losing all the weight off the gantry that Bowden offers. Thanks. I like your idea as well. I think that it has a great deal of merit for those who want to keep the extruder on the carriage (for any reason). Keep the torsional moments acting upon that poor little slider to a minimum. I never really liked the weight of the motor dangling so far below the slider to be honest. It appears that FT recognized this issue in their R2 version of these printers. If there were two sliders on the rail it wouldn't be so bad because there would be a larger mechanical moment arm to spread the load over. But alas it isn't the case. My front plate (I forget FT's name for it) is cracked at the bottom so the new support piece I made to replace the lower original piece reinforces it. I also built in an offset (see rendering) so that the slim cooler nozzle from Thingiverse (from onebaldman, a forum member I think) fits perfectly with the E3D/Volcano setup. I really like the Titan in a Bowden configuration and am unlikely to switch back to direct. However I don't like all the clicking noises it makes due to gear lash that I just can't seem to adjust out permanently. So I may end up with some version of a belt reduction extruder yet. But as a concept and practice, I definitely do like it. I have been able to tune the accelerations and jerk settings to get some pretty decent results with it. Tests prints of the common XYZ test cube for example look pretty good and motion oscillations and ghosting (overshoot) are greatly reduced. I don't run flex filament (yet). Over the Christmas holidays I may try running some. I'll likely try to come up with a more refined design over the coming weeks. I can see what you mean by wiring. I'll have to come up with some sort of wiring provision for the mount. Regarding your titan extruder. Have you only run it in the Bowden configuration, or did you have it on the gantry for any period of time? I've not had any issues with mine clicking. However, I did notice that if you loosen up the 4 bolts holding everything together, and don't ensure that large black plastic gear is fully meshed to the gear on the stepper shaft a noticeable backlash condition could be noticed. I wonder if this could be your issue. For the wiring, if you are retaining the e-chain I assume that you will either be raising the attachment point on the carriage or moving it to the left? Either way you may need to raise and angle the other end as well (at the X motor) so the chain moves in a more graceful arc. On mine I added a spacer between the X motor attachment plate and the right end of the e-chain. It raises the attachment by around 1-3/4" and adds a 15 degree angle. As for the Titan, I went straight from the carriage-mounted stock extruder to the Bowden mount on the left side of the frame. I had been having occasional issues with the original extruder missing steps despite raising the drive current as high as I dared (I was running the hot end a bit on the cold side and it was before the Volcano block was added). So I knew for certain that I wanted a geared (or otherwise torque multiplied) replacement. At first I thought I'd just buy a geared stepper, but the cost and greatly increased mass were major negatives. Then I planned to mount the Titan on the carriage. But in the end I realized that I really, really wanted to get rid of as much mass as possible, as an experiment if nothing else. This was because of ghosting and other artifacts that were obviously due to the huge reciprocating mass. These could not really be tuned out unless I slowed the printing speed way down. So it was mounted to the center side rail with about 425 mm of PTFE tube as a feed. The only actual problem I have had with it (other than the clicking) is that the tubing slipped out of the extruder end coupling once, but I caught it in time to save the print and have since secured it in place better. I have loosened the four bolts and snugged the gears up repeatedly. No matter what I do, upon fast reversals such as retractions it makes noticeable noise. It's not a whole lot of noise mind you. But it is a noise that didn't really exist with the stock extruder. I'm getting used to it I suppose. I don't want to run it too tight because I don't want to risk deforming the plastic gear teeth. Ahh yes, now I know what you mean about wiring. I never installed the cable chain to begin with. My concept is more of a bare-bones. I'll need to add provision for an attachment point to connect my wire loom. I currently run a "reverse Bowden" set up. I have my bundle of wires in some split mesh loom. and it is zip tied to the ptfe tube for a bit of stability. That's interesting about your titan extruder. I haven't run mine much since installing it, but haven't noticed it clicking. I read somewhere that you want the tension set to where it hurts your hand/fingers to pull it back. I have mine tight, but haven't tightened it up that tight yet. Might be something worth trying though. I ran a reverse Bowden feed to the original carriage-mounted extruder for about six months before deciding to go true Bowden. It worked quite well as a filament guide actually. I just wanted to reduce the moving mass. I may try really bearing down on the gear while I tighten the screws, but I do fear distorting the plastic gear, particularly if it sits idle for a while. I also designed and printed up a ball-bearing replacement for the floating roller lever because I disliked the idea of plastic running directly on the motor shaft (no matter what they claim). That might account for the differences in sounds. My lever runs basically without any drag on the motor shaft and is floppy loose if I loosen the spring tension.